Aims To assess whether plasma troponin concentration measured by a sensitive assay can predict 1-month and 1-year serious outcome, or all-cause death in patients presenting with syncope to the emergency department (ED). Methods Prospective cohort study of admitted adult patients presenting to the ED after an episode of syncope who had plasma troponin measured 12 h after syncope using the ARCHITECT STAT sensitive troponin I assay (Abbott Diagnostics). 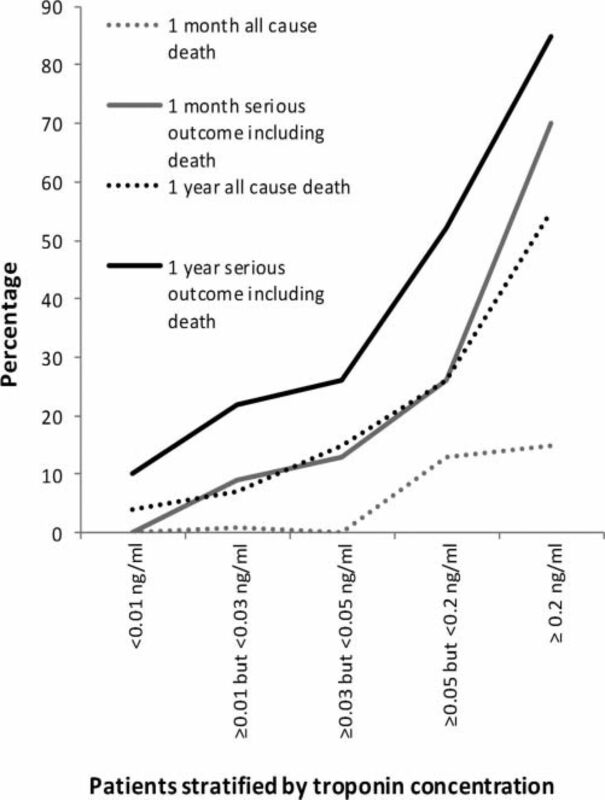 Primary endpoints were the composite endpoint of serious outcome or all-cause death at 1 month and 1 year. Results Between 1 March 2007 and 22 July 2008, 338 of 528 patients admitted from the ED with syncope had plasma troponin concentrations determined. Troponin concentrations were above the limit of detection in 261 (77%) patients. Patients numbering 120 (36%) had a troponin concentration ≥0.03 ng/ml (99th percentile of normal reference population), and 66 (20%) had concentrations ≥0.05 ng/ml (local diagnostic threshold for myocardial infarction). The proportion of patients with a composite serious outcome increased across patients stratified into quintiles based on peak troponin concentration at 1 month (0%, 9%, 13%, 26%, 70%) and at 1 year (10%, 22%, 26%, 52%, 85%). Conclusions The majority of patients admitted from the ED with syncope have detectable plasma troponin concentrations. Peak troponin concentration was associated with increasing risk of serious outcome and death, and this risk increases with higher troponin concentrations. Troponin may have a future role in the risk stratification of patients with syncope. Our group has already reported that plasma troponin concentration may predict 1-month serious outcome or all-cause death in syncope1 in a cohort of 289 patients enrolled into the ROSE study.2 These patients were admitted during the validation of a contemporary sensitive troponin I assay in our institution.3 During this period, only troponin concentrations above the diagnostic threshold of the previous conventional troponin assay (0.20 ng/ml) were reported to the clinicians, although absolute troponin concentrations were recorded in the hospital laboratory. In the present analysis, we assess the relationship between absolute troponin concentration and clinical outcome in all patients admitted during the ROSE study. The primary endpoints were a composite at 1 month and at 1 year of serious outcomes: all-cause death, acute myocardial infarction (AMI), life-threatening arrhythmia, insertion of a pacemaker or internal cardiac defibrillator device, pulmonary embolus, cerebrovascular accident or subarachnoid haemorrhage, haemorrhage requiring a blood transfusion of two units or more, or an acute surgical procedure or endoscopic intervention. Secondary endpoints were: all-cause death and serious cardiovascular outcome including cardiac death. A diagnosis of AMI was based on the Universal Definition of Myocardial Infarction4; detection of rise and/or fall of troponin concentration, with at least one value above the diagnostic threshold, together with evidence of myocardial ischaemia (symptoms of ischaemia, electrocardiogram changes indicative of new ischaemia, development of pathological Q waves, or imaging evidence of new loss of viable myocardium, or new regional wall-motion abnormality). AMI was counted as a serious outcome either if it was present at presentation or if it occurred after this initial assessment. Plasma troponin I concentrations were measured using the reformulated ARCHIECT STAT troponin I assay (Abbott Laboratories, Abbott Park, Illinois, USA). During the validation of this assay, only concentrations above our previous diagnostic threshold of 0.20 ng/ml (based on within-laboratory coefficient of variation of less than 10% using the previous conventional assay) were reported to clinicians. The assay was reformulated by the manufacturer to achieve a greater analytical sensitivity with a limit of detection of 0.01 ng/ml or less, a 10% coefficient of variation of 0.032 ng/ml, and a 99th percentile (male and female) of 0.028 ng/ml. Following completion of the validation of this assay we lowered our diagnostic threshold for myocardial infarction from 0.20 ng/ml to 0.05 ng/ml. Microsoft Excel (Microsoft Corporation, US) and PASW Statistics 17 (SPSS, Chicago, Illinois, USA) were used for analysis. The area under the receiver operating characteristic curve and its 95% CI were used to assess the predictive value of troponin I for each outcome. For each outcome measure, troponin I concentrations were compared between patients who did and did not experience the outcome using the Wilcoxon–Mann–Whitney test. Between 1 March 2007 and 22 July 2008, there were 2615 presentations with possible syncope (1.8%) of 145 676 presentations to the ED. Seven hundred and seventy-four patients were ineligible (younger than 16 years, previously enrolled, probable neurologic seizure, psychogenic, unclear history, alcohol related), 687 were not considered for enrolment by the attending clinician, and 54 refused or were unable to consent, leaving 1100 who were enrolled into the risk stratification of syncope in the emergency department (ROSE) study.2 At 1 year, 53 were lost to follow-up, leaving a total of 1043 patients available for 1-year analysis. A total of 338 of 528 (64%) patients admitted to hospital had a plasma troponin measured 12 h after syncope. Troponin was measurable above the limit of detection in 261 (77%) patients; 120 (36%) patients had a troponin concentration ≥0.03 ng/ml (99th percentile of assay), 66 of 338 (20%) patients had a troponin concentration above that of our revised diagnostic threshold of 0.05 ng/ml, but only 10 patients were diagnosed with AMI, according to the universal definition,4 at 1 month. The number of patients with a composite serious outcome increased across the five troponin I groups both at 1 month (0%, 9%, 13%, 26%, 70%) and at 1 year (10%, 22%, 26%, 52%, 85%) (figure 1 and table 1). Plasma troponin concentration (Abbott Architect STAT troponin I assay) measured 12 h after a syncope event showing that increasing troponin concentration is associated with increasing serious outcome and death at both 1 month and 1 year. This study shows that the majority of patients with syncope admitted from the ED have detectable troponin concentrations. Almost 20% of patients had troponin concentrations above our institution's current diagnostic threshold of 0.05 ng/ml for myocardial infarction. Yet only 2% of patients were diagnosed with myocardial infarction in our original study where a higher diagnostic threshold of 0.20 ng/ml was in use.1 We found that in patients with syncope, any increase in troponin concentration was associated with increasing risk of serious outcome and death at both 1 month and 1 year, even at very low levels of troponin. We recently demonstrated that in patients with suspected acute coronary syndrome, implementation of a sensitive troponin assay increased the diagnosis of AMI and identified patients at high risk of recurrent AMI and death.3 Our present findings suggest that small increases in troponin concentration are likely to be of clinical significance in syncope patients as well. The precise mechanism of increased troponin concentration in patients with syncope is unclear and may involve multiple different pathways. The majority of these patients have not sustained a myocardial infarct, and did not present with symptoms of myocardial ischaemia, or have evidence of myocardial ischaemia on the electrocardiogram. The Universal Definition of Myocardial Infarction makes a distinction between miscellaneous causes of increased troponin concentrations (congestive heart failure, renal failure, acute stroke or subarachnoid haemorrhage) and increased concentrations due to myocardial infarction. Furthermore, they proposed a classification of myocardial infarction based on aetiology defining type I myocardial infarction due to plaque rupture and coronary thrombosis, and type II myocardial infarction due to increased oxygen demand (arrhythmias, tachycardia, hypertension) or reduced supply (hypoxemia, hypotension). Measuring troponin concentrations in serial samples may help to distinguish between miscellaneous and secondary causes of myocardial infarction. If increased troponin concentrations in patients with syncope reflect the presence of underlying structural or ischaemic heart disease, or indicated the presence of significant haemodynamic compromise, then measurement of troponin may in the future be a useful way of identifying patients with syncope who require admission or further investigation. A large prospective study evaluating baseline and serial troponin concentrations is necessary to determine its role in the diagnosis and risk stratification of patients with syncope. Until then, current guidance to clinicians should remain only to measure troponin in syncope patients thought to be at risk of AMI. One notable limitation to this study was that not all patients being admitted had a troponin I measured. The cohort is, therefore, a selected (and presumably unrepresentative) minority of patients with syncope. We cannot, therefore, draw conclusions about the frequency of increased troponin concentration for all patients with syncope. There is also the possibility of incorporation bias as the definition of AMI at presentation, based on troponin level plus the inclusion of AMI as one of the serious outcomes, will artificially increase any association between troponin and serious outcome. The association remains significant at both 1 month and 1 year when the adverse outcome is limited to death (table 1), and also persists at 1 month (z=−4.98, p<0.001, Wilcoxon–Mann–Whitney test) and 1 year (z=−4.72, p<0.001, Wilcoxon–Mann–Whitney test) if AMI is excluded from the serious outcome definition (10 out of 45 serious outcomes at 1 month solely AMI; 15 out of 94 serious outcomes at 1 year solely AMI). This suggests that our findings are not explained by incorporation bias. It must also be remembered that the absolute troponin concentrations below 0.20 ng/ml were not available to the emergency or hospital clinicians at the time of patient enrolment. The majority of our selected cohort of syncope patients admitted from the ED have detectable troponin concentrations. Any detectable troponin is associated with increasing risk of serious outcome and death, and this risk increases with increasing troponin concentration. Measuring cardiac troponin using sensitive assays may have a future role in the risk stratification of syncope. Thanks to Carol Thomson and Glynis Stone in the RIE biochemistry laboratory for help with data acquisition.
. Diagnostic and prognostic utility of troponin estimation in patients presenting with syncope: a prospective cohort study. Emerg Med J 2010;27:272–6.
. Risk stratification of syncope in the emergency department: the ROSE study. J Am Coll Cardiol 2010;55:713–21.
. Task force for the diagnosis and treatment of non-ST-segment elevation acute coronary syndromes of the European Society of Cardiology. Guidelines for the diagnosis and treatment of non-ST-segment elevation acute coronary syndromes. Eur Heart J 2007;28:1598–660. Contributors MJR and NLM were responsible for the conception of the study. MJR was involved in the study design and data collection. MJR and CJW were involved in the analysis. All authors were involved in the interpretation of data and drafting the article. MJR takes responsibility for all aspects of the paper. Funding MR received funding from a Chief Scientist Office research fellowship (CSO/CAF/06/01). The sponsor of the study had no role in study design, data collection, data management, data analysis, data interpretation or writing of the report. The corresponding author had full access to all the data in the study, and has final responsibility for the decision to submit for publication. Ethical approval The study was granted ethical approval by the South East Scotland Research Ethics Committee 03 (09/S1103/42). Written consent was obtained from all patients prior to enrolment.